We completely stopped buying breads, cookies, crackers from store and rarely fresh breads from bakery. But my kids love breads and cookies a lot, they love bread in any form, simple toast to sandwich, upma anything. Breads are there most favorite food but because of the preservative ingredient we do not buy breads, cookies. So once in 10 days or 2 weeks once I bake it at home. Anything that is homemade is always fresh, good and free from preservatives. And that too our favorite cookies/cake or bread with some healthy ingredients means that is most welcome right? 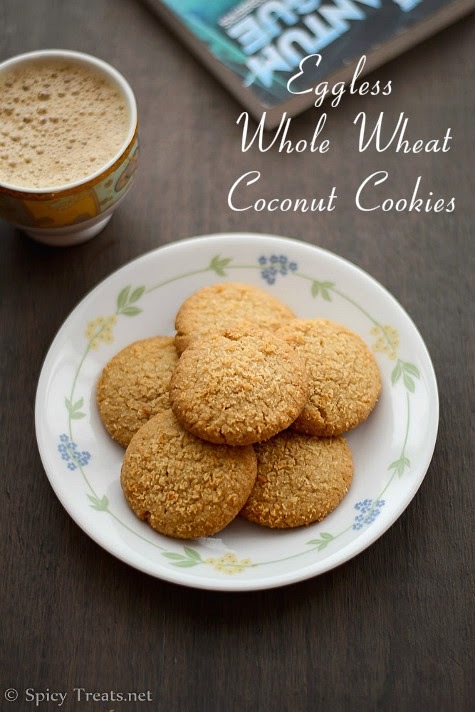 This Whole Wheat Coconut Cookies is one such recipe, delicious and melt in mouth flavorful cookies using whole wheat flour without eggs and less sugar when compared to other cookies. 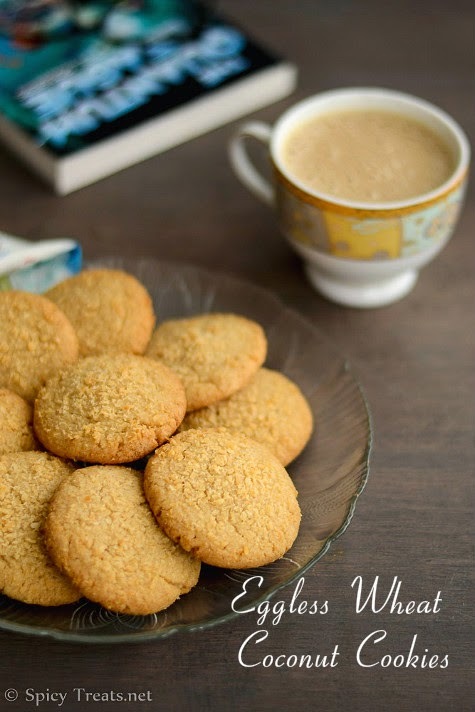 I bookmarked this recipe from Hari Chandana's blog, have tried this Wheat Coconut Cookies couple of times and now it is our family's favorite cookies. 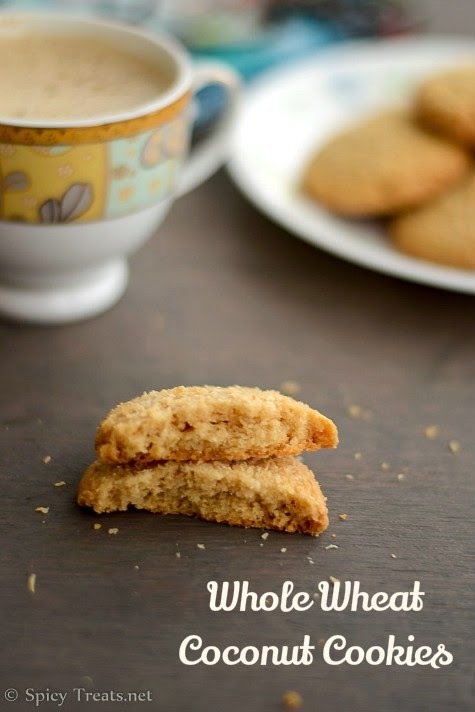 This wheat cookies does not involve more fancy ingredients, no egg and just the basic ingredients. It can be made without coconut also for a plain vanilla flavored cookies. This is sure a keeper recipe, do try this cookies for your kids. These are best to serve along with hot chai or coffee for tea time snack. Preheat oven to 180 C/350 F. Line a baking tray with parchment paper or silicon mat. Grind sugar into a fine powder and set aside. In a mixing bowl, add butter and powdered sugar and beat until light and creamy. Add vanilla, salt and combine. Now add the wheat flour and dessicated coconut and mix everything well. Then add milk little by little and mix well to make a smooth and soft dough. Now dip the top of the flattened cookie dough in coconut and arrange it in a parchment lined baking tray. Do repeat the same for all dough and place them on a baking tray spacing about 1 inch apart. Bake the cookies in preheat oven for 18 minutes. Once done remove from the oven and let it cool down for 2-3 minutes. Cookies will be very soft now but it turns crisp and crunchy after cooling. After 3 minutes transfer the cookies to the wired rack and let it cool down competely. Store the cookies in an air tight container. *sugar - 1/2 cup, I reduced 2-3 tbsp sugar from 1/2 cup and that sweetness was perfect to us. If you are sweet tooth then add 1/2 cup sugar for mild sweet reduce sugar 1-2 tbsp from 1/2 cup. cookie dough for 10 minutes. As the dough was very soft and buttery, I don't want my cookies to spread so to be on safer side I refrigerated the dough. The chilled dough holded the shape well. You can also skip coconut and bake it as a plain Vanilla cookies. 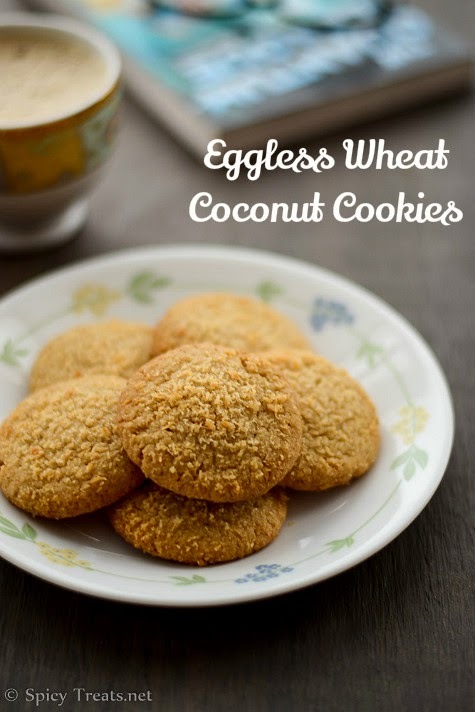 Sangeetha.....happy & tnx for this post.Coconut Cookies are my favourite...surely try this week and tel u ...texture and crunchiness luks same...i loved it..
Would love to munch few from the screen, so perfectly made cookies. Yummy looking cookies. Neat presentation and very nice clicks. Made these yesterday with my friend. We use old cooker to make cookies. I added fresh coconut instead of desiccated coconut. When I mixed the dough I felt the dough to be loose and can't quite form into a ball and then it flattened out while baking. Then I refrigerated it and made the second batch n tat too flattened out. Don't know wy. But cookies tasted delicious with taste in between coconut burfi and cookies. moisture from fresh coconut, sugar amount, butter qty all matters...i haven't tried with fresh ones...glad that the final product turned out good. Thanks for sharing your feedback. Just tried out the cookie. Followed exact recipe. But my cookie got burnt in the bottom and not cooked from inside. I used the parchment too. What am I doing wrong? It happens with any baking I do, things get burnt from bottom n remains 25% uncooked inside. I am using Morphy Richards OTG. Any tips? Help! Next time try to bake it in lower temperature, say 320 or 300 F for little extra time,3-4 minutes extra.. Use good quality cookie sheet for baking. And let me know the brand of oven which u r using? Here, we have Range with Convection oven! That looks so perfect dear.. Thank you for the recipe, my cookies turned out marvelous!! I added 1/4 tsp baking powder in one batch, they have become super crunchy melting in mouth!!! Made these cookies today and it came out perfect, had added fresh coconut and almond powder and the aroma tht filled the entire house was heavenly. Thanks for sharing it. Hi Sangeetha, I made these today. They didn't turn out crispy. I am amazed at how crispier your cookies turned out without adding baking powder. My dough was little bit dry- Should it be lot softer ? - I refrigerated it overnight. I also added little yogurt in the dough. I didn't use parchment paper. I cooked a little bit longer than you suggested - It didn't apparently like yours. Where did I go wrong ?Please let me know . Thanks! Yes.,the cookies was crispy like Indian biscuits. It wasn't like soft/chewy cookies. Yes.,the dough was soft and Refrigeration is not required and it is not mentioned in the original recipe too...i just kept it only for 10 minutes...no need to do over night. It is good to use parchment paper for baking cookies. No need to add yogurt..try the recipe with exact measurement and method. It will come out good. The cookies turned out very well!! Thanks! Hi , I tried these cookies. I followed the same measurements but still they did not turn as good as urs. specially the color is light cream color and they were hard. what would have went wrong? hi..i tried these cookoes today..it turned out perfectly crispy from corners.it was cooked well on top.but the bottom part was little less cooked and didnt turned crunchy..pl guide wat was missing. Hi, In that case you can bake for another 3-5 minutes or next time try baking at reduced temp(300 or 325 F) for more time. This way the cookies gets baked perfectly without burning. Hope it helps !